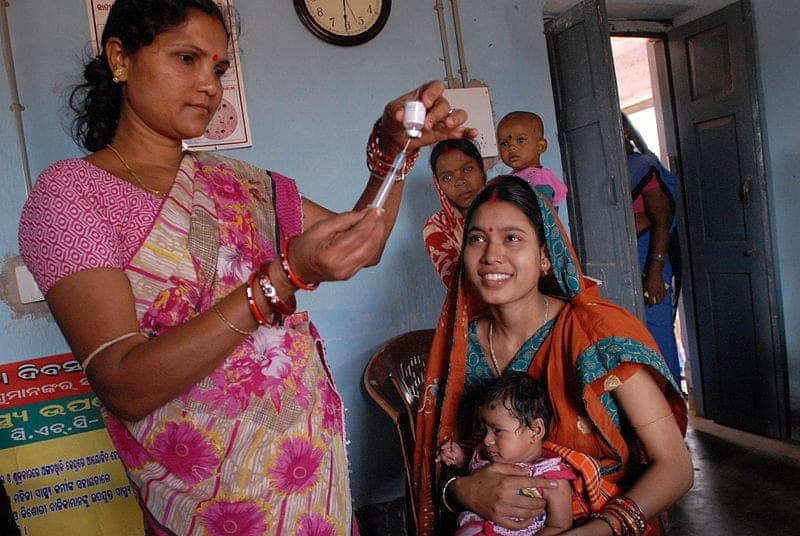 A community health worker administering a vaccine in the Odisha state, India. Image credits Pippa Ranger /DFID – UK Department for International Development. This Sunday, Prime Minister Narendra Modi announced that India wants to offer free coverage for over half a billion of its poorest citizen. The new insurance scheme — dubbed “Modicare” — will cover 100 million of the country’s lowest-income families (the bottom 40% bracket). Each will receive services equivalent to the sizeable sum of 500,000 rupees (roughly $6,900) per year to treat serious ailments. The program mainly addresses secondary and third healthcare. For primary care — basic services usually provided by general practitioners or nurses — the government plans to open 150,000 “health and wellness” centers, staffed by nurses, traditional medicine healers, and other health workers, by 2020. “Indian healthcare is poised for a great leap forward with Ayushman Bharat – which will insure over 50 crore [500 million] citizens,” tweeted Health Minister Jagat Prakash Nadda, referring to the program by its official name, “Long Life India”. The initiative is without a doubt very good news for India, whose public health system experiences systematic shortages of facilities and doctors, forcing many to opt for private healthcare. A private consultation, however, can cost up to 1,000 rupees (about $15), which is a very high bill for the millions of locals living on under $2 a day. Government estimations also show that around 60% of the average Indian family’s spending goes towards buying medicine and wider healthcare services. Many of the country’s poorest, thus, make do without visiting a doctor, with disastrous consequences. For these people, Modicare could be a game- (and life-) changer. “We want to strengthen the hands of the poor and stand shoulder to shoulder with them in pursuit of good health,” Modi posted on Twitter. The initiative, however, is not without its critics. There are fears that increased demand created by Modicare would place an even greater strain on India’s already-faltering health infrastructure. It also is expected to drain the central and 29 state governments $1.6 billion per year in total. Funding will also be gradually increased should demand increase. Cost is one of the central points of discussion around the scheme. Critics are skeptical that the government will be able to actually fund such a huge system, accusing Modi’s government of trying to use Modicare to draw in votes ahead of the next elections, which will be held in May. In their eyes, Modi plans to coast along to a second term on the back of a pro-poor policy platform, of which Modicare will play a central part. “This is going to be another scam. It will benefit only private insurance companies. The citizen of the country will realise later that it is nothing but an election gimmick,” said Sanjay Nirupam from India’s Congress Party, the main opposition party. Prathap Reddy, chairman of private hospital chain Apollo Hospitals, believes the private sector is “rightly worried” about pricing and reimbursements. Still, others say that Modicare should have aimed to provide day-to-day healthcare for the people, instead of focusing just on secondary and tertiary care for more serious and long-term treatment as it does now. While some of the criticisms raised at the program are more worrying — and could have dramatic consequences, should they prove true — the fact remains that Modicare is, for the most part, uncharted territory for the Indian government. Modi himself has gambled hugely on the program and has essentially signed a blank cheque to make it work — the government has allocated $7.2 billion for now but has committed to providing more on request, says Vinod K. Paul, the program’s creator. The final budget, he explans, is difficult to pin down because nothing like this has been attempted before. Hopefully, Modicare surprises everybody and enjoys a resounding success. A recent study showed that substandard healthcare was responsible for an estimated 1.6 million deaths a year in India, the highest number anywhere in the world.